PROVIDENCE, R.I. — November 12, 2018 – The combined power of two of the region's prominent higher education institutions – one an internationally recognized food authority, one an internationally recognized design authority – and a venerable local food hub is changing the way college students eat. JWU and RISD dining programs are one of five New England multi-institution teams receiving awards this year. Last April, the Foundation challenged foodservice leaders from the region’s more than 200 college and university campuses to submit bold, collaborative, catalytic ideas for consideration. 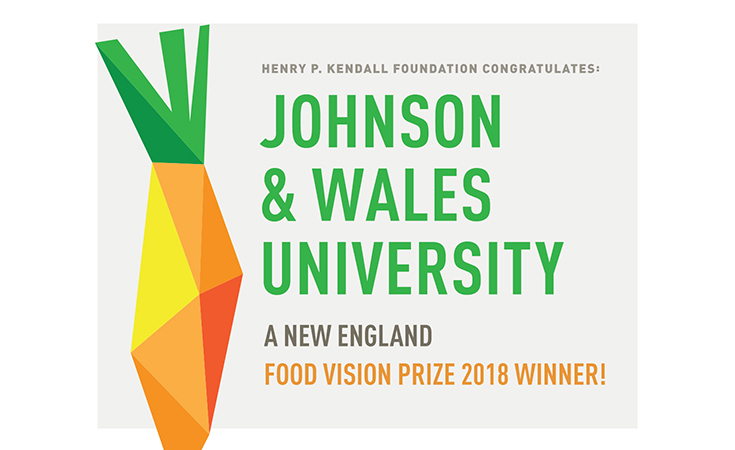 The New England Food Vision Prize is designed to accelerate progress towards the New England Food Vision, a regional goal to produce at least 50 percent of New England’s own food by 2060, while supporting healthy food for all, sustainable farming and fishing, and creating thriving communities. One high-leverage strategy to accelerate the region towards this goal is to unlock the market power of large food purchasers, such as colleges and universities. The Prize is designed to support ideas that result in higher procurement of regionally grown and produced food by institutions, more regional food on campus menus, and increased demand for regional food by students while on campus and beyond as alumni. “For more than 60 years, the H.P. Kendall Foundation has supported visionary projects and leaders,” said Foundation Executive Director Andrew Kendall. “By leveraging the large-scale buying power of the region’s colleges and universities, we can create the consistent long-term demand local farmers, fishers, and ranchers need to sustain and grow their operations. The ideas represented by this round’s winners reflect the kind of ingenuity we need to build a healthier, more sustainable food system in our region." Farm Fresh RI is a 501c3 nonprofit founded in 2004. The local food hub’s mission is to grow a food system in Southern New England that values the environment, health and quality of life for both the farmers and eaters in the region. To build healthier communities, increase access to fresh food, strengthen community-based businesses, and improve the impact of food production and distribution on the environment, Farm Fresh RI offers a wide range of programs and services that support hundreds of farmers and food producers, and connect tens of thousands of consumers to locally grown food each year. Farm Fresh RI farmers markets and transparent enterprise systems help local farmers, fishers, and small food businesses reach more customers. And the organization’s work with the community through outreach, nutrition incentives, and educational programs help increase the accessibility and affordability of fresh, local foods. For more information, visit www.farmfreshri.org.